Inkosi ya Makosi M’mbelwa V taking his turn to receive the National ID Cards on behalf of Paramount Chiefs during the launch ceremony in Lilongwe. Malawi President His Excellency Prof. Arthur Peter Mutharika (centre) shaking hands with one of the representatives that received their National IDs during the launch ceremony. Malawi President His Excellency Prof. Arthur Peter Mutharika and First Lady Madame Dr. Gertrude Mutharika watching proceedings during the launch ceremony of the National Identity Card at Bingu International Convention Centre in Lilongwe. Minister of Home Affairs and Internal Security Grace Obama Chiumia, MP was to her seat after delivering a speech during the National ID Launch in Lilongwe. Malawi President His Excellency Prof. Arthur Peter Mutharika (seated centre) and First Lady Madame Dr. Gertrude Mutharika posing with representatives of various sectors who received their National ID Cards during the launch ceremony. NRB Director Mrs.Sophie Kang’oma (right) watching proceedings during the launch of the National Identity Card at Bingu International Convention Centre in Lilongwe. Traditional Authorities (in yellow) from around Lilongwe district were also part of the National ID launch ceremony. Birth Certificate before handing over to a baby. First lady poses with a baby and her mother after being handed over a Birth Certicifate. Registration: The registration of births, adults, marriages, resident foreigners and deaths. This has been devolved to all the district councils in the country. The District Registration Offices in the office of the District Commissioner perform this function through the decentralized structures at district level. The National Registration Bureau (NRB) is a Government Department under the Ministry of Home Affairs and Internal Security. 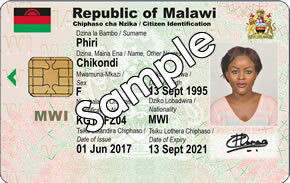 The National Registration Act of 2010 mandates the NRB to implement, coordinate, manage and maintain the National Registration and Identification System (NRIS) in Malawi. NRB has the following deliverables: Birth and Death Certificates; National Identity Cards for bonafide Malawians; Identity Cards for foreigners; and Certificate of Registration of Marriage.